During his brief life, the French artist Yves Klein made close to two hundred monochrome blue paintings. He considered this color, “patented” in France in 1960, to be similar to pure space, and felt it could be quite mystical in its effect on the viewer. Powerful as the original Klein works may be, for the most part one can only enjoy them in a gallery, and then only for a few minutes at a time. Owning one is, for most people, utterly out of the question, with recent paintings selling for as much as 20 million dollars. True appreciation and enjoyment of meditative works such as these can only be developed over time, in the privacy and solitude of one’s home. Inspired by Klein’s monochrome works, and influenced by the artist’s deep commitment to contemplative exploration, these pieces bring the depth and purity of pure space into one’s living field for daily engagement. These are authentic works on canvas, by Joseph Wagner. They are not copies or prints, but inspired originals. They allow close meditation and regular, unhurried reflection and contemplation. Each work is unique. Size is 24 by 36 inches. There may be additional shipping fees for these pieces. We will contact you to discuss options once your order is placed. I remember the first time I spent ten or twenty minutes in front of a painting. It was my first trip to New York, and I discovered the abstract expressionists. Rothko. Pollock. As I gazed at the paintings, they started to breathe. I couldn’t walk away from them- they came to life, and I was literally drawn into them. I recently read a NY Times article about a “revival” of Yves Klein, a totally unique abstract painter. What is it about Klein’s art that is so moving, so mystical? With Pollock, it’s the fascinating play of lines and colors that draws you in. With Rothko it’s the vibrations of subtle layers of colors that come alive on the canvas. But what is going on when people have deeply profound experiences from “soaking up” Klein’s monochrome blue paintings? 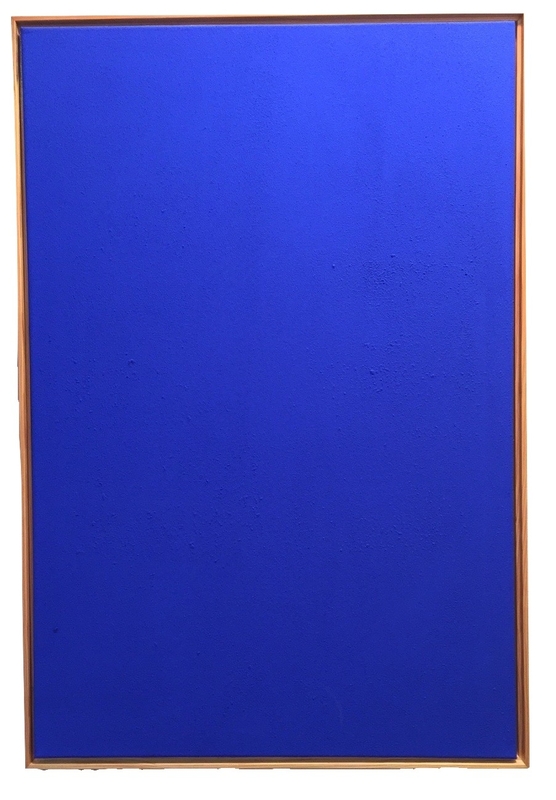 Klein spent years discovering the perfect pigments and binding for his “International Klein Blue,” very similar to the mystical “lapis lazuli” in medieval paintings. Klein said, “Blue is beyond dimensions. Blue suggests the sea and sky. Painting this way, I met the empty, the deep empty, the depth of the blue.” Klein’s fascination with Zen and his mastery of judo (he was a black belt and wrote the book “Foundations of Judo” at the age of 24) created a ground where the artist could generate paintings that are not an expression of feeling or personality, but are simply experiences of the awe and wonder of pure color. Is this similar to Buddhists who do sky gazing practice, dissolving into the blue sky in order to leave the narrow confines of the ego and achieve a fresh way of experiencing reality? The results of his work can be seen on his website, and his work can also be purchased and viewed by meditators and art lovers as an aid to contemplative practice, or simply enjoyed for its own sensuous, enchanting qualities. Roberta Smith’s NY Times article on Klein concludes with her appreciation of his work: “The blue monochromes remain his most singular achievement”, they are the “architecture of the air. . .
His blue paintings have the distinction of revealing him at his most glamorous but also his deepest.” It will be fascinating to see if Joseph Wagner can continue to re-create Yves Klein’s vision in an accessible way.